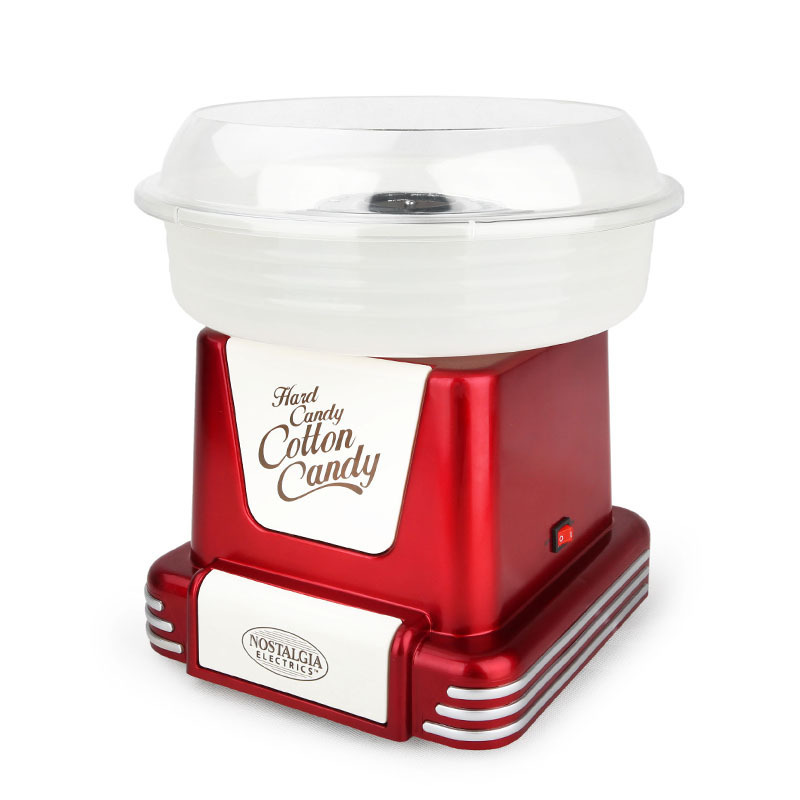 The Nostalgia Electrics PCM805 RETRORED Cotton Candy Maker is manufactured by Nostalgia Electrics, who were inspired by all things American during the 1950’s, which is clearly evident in the design of this device. With its red and retro looks, those who remember the days of the 50’s will instantly fall in love with this machine, and any modern day lover of old fashioned machines will not be able to resist this device. This cotton candy maker is small enough to stand on the countertop which eliminates the hassle of having to store it away when it is not in use. This machine is also easy to use with a power switch mounted on the side of the machine and just as easy to disassemble this machine when it needs to be cleaned. This machine takes roughly up to 5 minutes heat up time with a few minutes extra before the sugar starts to spin in to cones of cotton candy delights. This device comes with a translucent, plastic bowl as well as two plastic cotton candy cones. Extra sugar cones, hard and sugar-free candy are sold separately. This cotton candy maker allows the user to make cotton candy with hard candy, sugar-free candy, and the normal cotton candy sugar. So if you have a favorite hard candy that you enjoy, this device allows you to experiment with that candy and allows you to take that flavor and turn it in to that same soft cotton candy floss. Although this machine enables you to use all three variations of sugar, each will produce the same fluffy cotton candy that kids and adults can not wait to taste and enjoy. When planning my sons 6th birthday party recently, I found pictures of cotton candy treats and cotton candy used for decor. I was so excited to find out I could own my own Cotton Candy machine for less than it costs to rent a machine for a day. 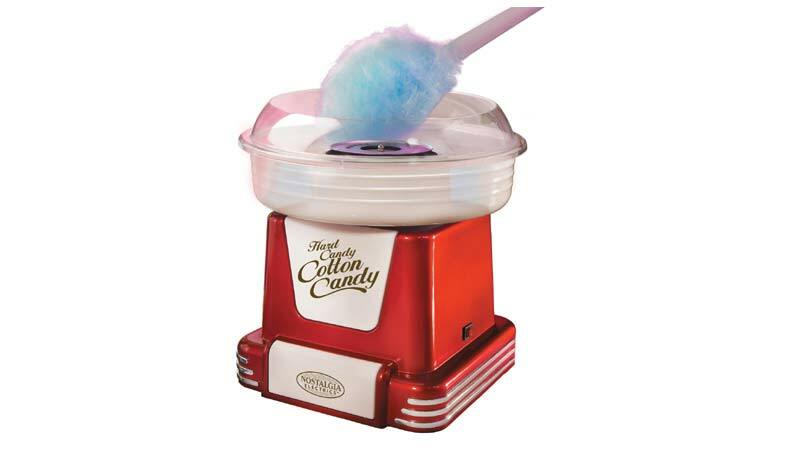 The Nostalgia Electrics PCM805 RETRORED Cotton Candy Maker was perfect! Not only was it affordable and functional, it looked the part. I ordered it a week before the party. The day it arrived, I started playing and familiarizing myself with how it works and I just love it! Needless to say, the birthday fun started a week early. I used the traditional pink and blue flossing sugar which made the perfect fluffy balls of cotton candy. As the Nostalgia Electrics Cotton Candy Maker is relatively small and not designed for mass production, I recommend preparing some cotton candy before hand and storing it in bags. On the day of the party, everything sweet was topped with a tuft of cotton candy which made for a stunning party table and delicious treats. I have subsequently used it several times for school events and gifted one to a friend for her daughters fairy party. This has definitely been the most fun I have ever had with a kitchen appliance.